Tea Tree Oil for Dogs | Is it Safe to Use? Tea Tree essential oil (Melaleuca alternifolia) has very powerful antibacterial, antiviral and antifungal properties, and it is quite safe to use on human skin, even undiluted. It is no wonder that many pet parents want to know if they can also use Tea Tree oil for dog health issues. Already there are actually quite a few natural dog products (e.g. doggie shampoo, spray, etc.) that contain Tea Tree oil. 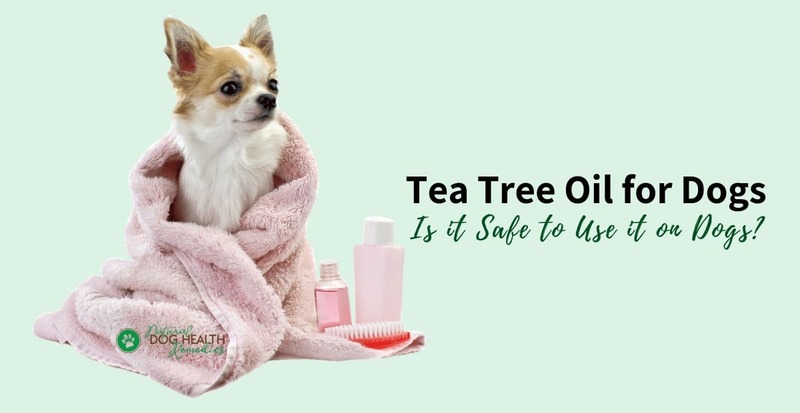 So, coming back to the question: Is Tea Tree oil safe for dogs? 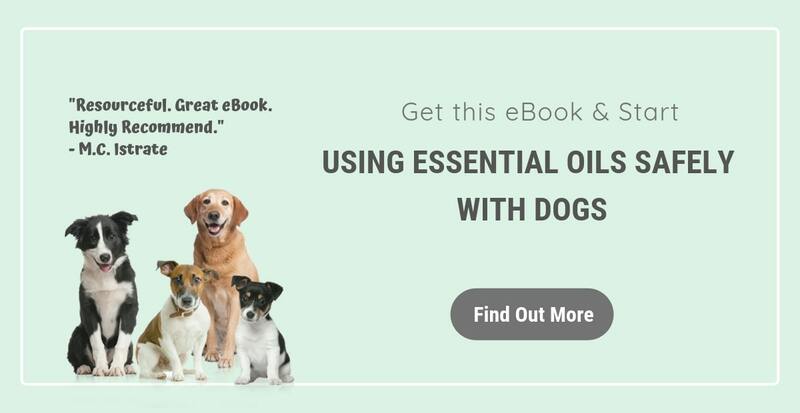 The thing is, there are anecdotal reports on dogs showing adverse reactions after inhaling Tea Tree oil or having the oil applied to their skin. But there are also anecdotal reports on dogs doing just fine after Tea Tree oil use. It seems that it all depends on the individual dog. A 2014 report based on ten years' worth of data (January 2002 - December 2012) retrieved from the ASPCA Animal Poison Control Center database may help shed more light on this issue. The report looked at cases of 337 dogs and 106 cats who had been exposed to 100% undiluted Tea Tree oil, either orally or topically, or both. Of the 443 animals exposed, 343 (77%) developed an adverse reaction consistent with toxicity. The most common toxicity symptoms shown by the 343 animals included increased salivation or drooling, depression, lethargy, muscle weakness, muscle tremors, and a lack of coordination. Toxicity signs and symptoms appeared within 2 to 12 hours after Tea Tree oil exposure and lasted up to three days. Younger and smaller cats were at greater risk of developing major adverse reactions. Is Tea Tree Oil for Dogs A Definite No-No Then? Looking at the report, you may say that a 77 percent rate of adverse reaction is pretty high and therefore Tea Tree oil should definitely not be used with dogs. However, remember that the animals in the report were exposed to 100% undiluted Tea Tree oil. Usually, when using essential oils on dogs, we use a low dilution (0.5% - 1%). Also, we do not give essential oils to dogs orally. So... if we followed some safety guidelines when using Tea Tree oil on dogs, we might not see the kind of adverse reaction noted in the report. But having said that, it appears that size does matter when it comes to using Tea Tree oil with dogs! Smaller animals tend to be more adversely affected by this oil than bigger ones. If I had a small dog, I would choose NOT to use Tea Tree oil on or around the dog just to be on the safe side. 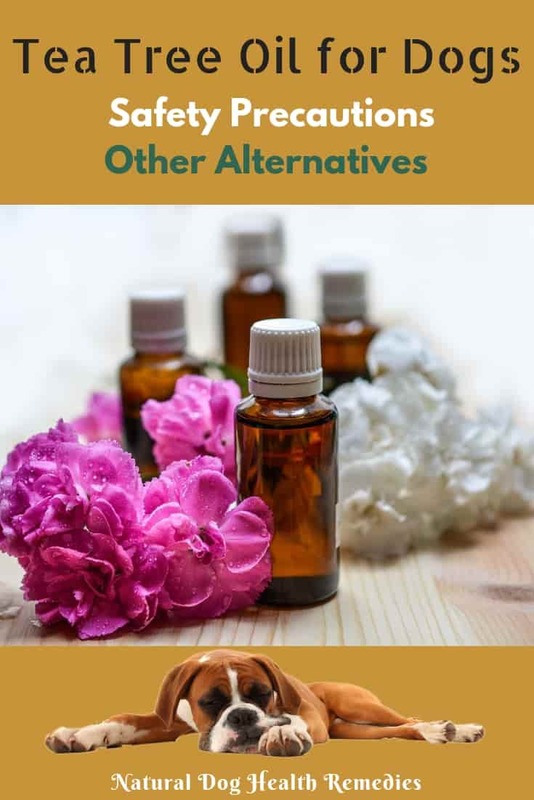 Also, I would avoid using oils (whether Tea Tree or other EOs) on young puppies, old dogs, dogs with sensitive skin and dogs with weakened immune systems. The bottom line is, all dogs are individual beings and may react differently to the same oil. It's your call as to whether or not you want to use Tea Tree oil on your dog. If you do, use it safely and responsibly. Follow the safety guidelines below. Make sure that the essential oil is 100% pure. Get your oil from a reliable store. Store the bottle of oil in a cool dark place with the cap tightly on. Tea Tree oil has a shelf life of only 1-2 years after distillation, and shorter if it is constantly being exposed to heat, light or oxygen as it will become oxidized. Tea Tree oil (all essential oils for that matter), when oxidized, becomes skin irritating. Keep essential oils out of the reach of your dog. Always dilute Tea Tree oil with a carrier (e.g. jojoba oil, aloe vera gel, etc.). Start with a low dilution (3-6 drops of tea tree oil in 30 ml of carrier oil), and always do a patch test first to see if there is any skin irritation. If you want to make a Tea Tree spray using water or hydrosol, use a dispersant such as Solubol. If you only use water/hydrosol without the dispersant, shake REALLY well every time before spraying. Do not apply the oil on a dog's face (in particular, do not put any oil near the eyes, the nose, inside the ears and the mouth). Also no oil on mucuous membranes and genital areas. Dogs like to lick - particularly if there is something (e.g. essential oils) applied on their skin! Usually it is not a big problem if the oil is applied in a diluted form. But still observe your dog carefully to see if s/he shows any allergic or adverse reaction. If so, use a cool wet cloth and some mild soap (e.g. castile soap) to wipe the area, then rinse it with clean water. Always give your dog a way out - leave the door ajar so that she can leave the room easily if the aroma is too overwhelming for her. Do not diffuse for hours on end (follow this guideline even if you don't have a dog in the house). Diffuse for 20-30 minutes and stop for at least the same length of time. Diffusing like this 2-3 times a day is more than enough. When diffusing for the first time around your dog, observe her behavior closely. If you see signs of discomfort (e.g. panting, restlessness, pacing, breathing difficulty), remove your dog from the room immediately. If symptoms persist or get worse, take the dog to the vet. What if you are not comfortable diffusing Tea Tree oil around your dog, but want to harness the antiseptic power of the oil to "disinfect" your house during the cold and flu season? Tea Tree Oil for Dogs - Any Alternatives? Tea Tree oil is great to use to boost the immune system and prevent infections due to its strong antimicrobial properties. The good news is, it is NOT the only oil that possesses such properties. Now, although the essential oils listed above are considered "safe" for dogs, it is a general statement. As I mentioned above, all dogs are different and may respond differently to an oil. What that means is, even if you are going to use a safe oil with your dog, please exercise the same precautions (e.g. patch test, observe dog's reaction, etc. ), especially if your dog has never been exposed to the oil before. How About Tea Tree Oil for Cats? Tea Tree oil is an absolute No-No for cats. Simply put, cats do not possess the enzymes that allow them to properly metabolize and excrete certain chemical components found in a number of essential oils, including Tea Tree oil. In fact, as it is still rather unclear as to which chemical components cats cannot metabolize, it is better NOT to use ANY essential oils on or around cats at all, just to err on the side of caution. For cats, I would just use hydrosols.